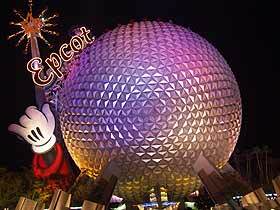 Experience the wonders of technology, and travel the world at Epcot. Begin your journey of discovery through 'future world' where you can try out the technology of tomorrow - today. Why not try a real vehicle testing ground at Test Track, this ride is extremely popular. Explore 11 Countries around the world on your way. Do not miss the spectacular night-time display, with its breathtaking reflections of Earth.